DCUSU President Niall Behan spoke about his personal experience with mental health and wellbeing after the death of his father in a speech to students in UMASS Boston. 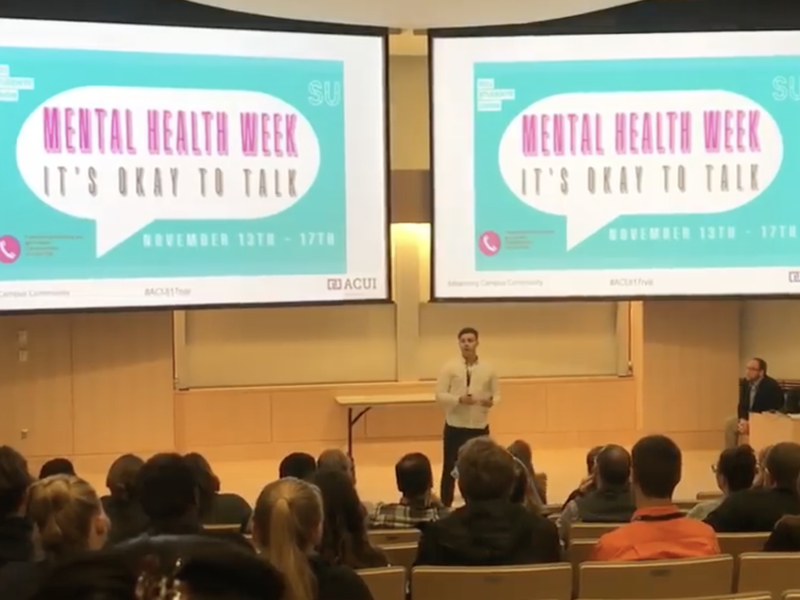 The speech at the ACUI conference was part of a ten year partnership between DCU and UMASS Boston, and came at the end of Mental Health week in DCU. Behan described his dad John as an “extremely loving father” and “really good role model”. His father worked for the government and he described a childhood where his dad always brought him on trips like fishing, camping and hiking. “Unfortunately when I was seven years old he grew very sick with depression and he was extremely strong minded, he had a lot of friends and a lot of close family, but in a very short period of time, about two months, he actually died as a result of suicide,” he said. “One thing that stuck with me was the embarrassment that I felt about talking about what happened to my dad and that was something that I couldn’t get away from because that was a feeling that wasn’t my issue but was society’s issue. We cannot talk openly about mental health issues because they are different in society to a physical issue,” Behan said. “I always felt as though these things that happened to me made me less valuable to society than those around me because I actually almost wished that my dad had of died of something that was more well known or more easy to talk about”. He highlighted that males are five times more likely to die by suicide than females in Ireland, and the age group with the highest percentage are middle aged men, according to the HSE’s National Office for Suicide Prevention 2016 report.